My husband loves oatmeal like he loves fishing, wine and the occasional cigar. I am not over exagerrating. A bowl of warm, homemade oatmeal on a chilly weekend morning is very comforting. We decided to cook up some apples with it from the orchard pile we are working through (thus the plethora of apple recipes on the blog lately) for his birthday weekend today. When I had my first bite, I swear it tasted like apple pie! Delish. In a medium saucepan over medium heat, melt the butter. Add the apples, brown sugar, cinnamon and 1/2 cup apple cider. Cook for about ten minutes, stirring occasionally, until apples are softened. Add the 2 cups milk, the rest of the cider, salt and oatmeal. 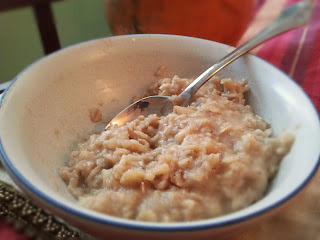 Mix well, and cook over medium-low heat for 7-10 minutes until oatmeal is tender and creamy and liquid is absorbed. Serve warm with an extra sprinkling of cinnamon.